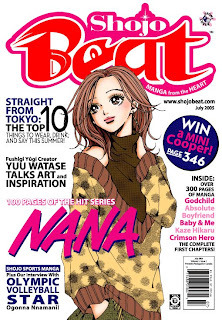 The demise of Viz’s Shojo Beat magazine fills me with great sadness. I’ve been a loyal Shojo Beat reader since the very start. I have every issue, including the initial preview issue. I never subscribed, though, not because I couldn’t afford it, but because I heard so many horror stories from SB subscribers having problems with their subscriptions. For me, it was just easier to pick up the new issue at the newsstand. Even from the start, the magazine surprised me. I expected to fall for Nana with its rock n roll aesthetic. After all it was intended for “older” girls. But instead I fell hard for Crimson Hero and its scrappy heroine Nobara. I loved reading about the volleyball tournaments and watching the matches unfold. There was something refreshing about how Mitsuba Takanashi showed raw female athleticism. Ironically the romantic subplot bored me to tears. Then the changes started coming. Series were rotated in and out with alarming alacrity. Shojo Beat became more of a preview ground for upcoming trade releases than continuing serials, so it was hard to get too attached to a series you liked. The theory was you’d buy the trades, which was good for sales of the trade line, but not so helpful for a magazine struggling to find and keep an audience. I always wondered what would happen if Viz decided to take Crimson Hero out of the lineup. I never had to make that decision. Crimson Hero was the only one of the initial series to stay in the magazine throughout SB’s run. There were external changes too. The magazine switched to colored pages similar to ones seen in the Japanese manga phonebooks. With densely inked artwork, that sometimes provided a challenge to reading the magazine, but maybe that was older eyes. The content became more and more girl-friendly, focusing heavier on fashion and makeup and crafts. They even acquired a cover model, affectionately known as the Beat Girl, drawn by different artists. Not all fans were too happy with these changes. From my small sampling of the lj community for the magazine, some fans disliked the shift away from what mattered – the manga. That was why they read the magazine. Part of me wonders if Viz, in trying to find new ways to appeal to this new readership, got a little lost along the way. Not that Viz wasted any time mourning Shojo Beat. They’ve already opened their newest venture online: Ikki magazine online. In Japan, Ikki is a seinen magazine, geared towards young men aged in late teens to college and beyond. The American version will feature similar content as its Japanese counterpart, if cherry-picked by the Viz editors to find the best series for American audiences. I’m of two minds about the whole thing. For some reason, I do read quite a lot of seinen. David Welsh summed up some of my theories of why in his plea to Kodansha in his “Unflipped” column. The seinen I’ve read seems to cut across the gender/age barriers and focus on providing an interesting and sometimes provocative story. Even my favorite Victorian romance “Emma” is actually seinen. So was the adaptation of “Voices of a Distant Star”. That said it still leaves shojo fans feeling extremely left out of the fun. The Shojo Beat line will continue to appear as trades only. Why not shift some of the shojo content online if Viz is so willing to dip into that pond? Shojo Beat was already an established brand and they had the website already set up. If nothing else, they could have made their website more community-oriented to draw in those young girls already chatting online. Shojo isn’t as marketable as Shonen. That’s what they keep telling us. Shonen has all the big guns -- the anime, the video games, the trading cards, the action figures, etc. Let’s face it, little boys love their toys. Circulation figures certainly back some of that. Shonen Jump has a circulation of 200,000 and Shojo Beat around 38,000. From a financial perspective, it’s unfortunately easy to see why SB had to go. But I’ve got to play devil’s advocate and wonder how hard they tried. Shojo spawns its fare of anime series and soundtracks and drama cds. It also has its share of miscellaneous merchandise – the pencil boards and keychains and cellphone charms. The closest Viz has to shojo juggernaut is the after-mentioned Nana, but it is all and all, a rock and roll romance. Tokyopop has Fruits Basket which is getting a couple of fun Macy’s events. Which begs an interesting question: is shojo merchandising limited because it’s intended for girls or because of the stories themselves? I know I'm not a typical fan. Sometimes I felt like an old lady reading over the cool kids' shoulders, just to see what all the fuss is about. Sometimes I felt like a younger me reading YM/Sassy looking at the fashion and makeup ideas. And sometimes I enjoyed having some mindless entertainment I could read every month. I just feel for those teen girls who did follow the magazine and wish I didn’t feel like Viz had given up on them.